We are no longer offering specialized search services at google.com/linux, google.com/microsoft, google.com/bsd, google.com/mac, google.com/about and google.com/unclesam. These services were established many years ago to offer search across a limited index of the web, which in the past was a better way to find this information. For example, google.com/linux was designed to help people find information from message boards and blogs about the Linux operating system. Today, search quality has advanced tremendously, and based on our analysis we’ve found that in most cases you're better off looking for this kind of specialized information using the regular Google search box, for example by typing [linux fedora upgrade]. We understand that some users were surprised by this change, so we apologize for not communicating more clearly in advance of redirecting these services to google.com. For more advanced search tips to restrict your search to particular sites and kinds of information, we recommend taking a look at our Help Center. This month you probably noticed that we had our "Uncle Sam" search off of our home page (It's the next best thing to the CIA) that is now housed on the "more Google" page under the title of "special searches." This search covers all the .mil and .gov domains. So if you are looking for something published by the government, this is the best place to start. 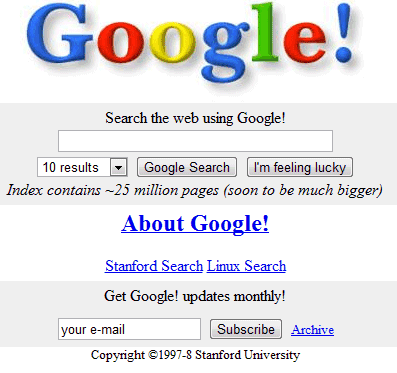 Back in 1998, Google's first homepage linked to Stanford Search and Linux Search. Google has recently updated many of its corporate pages: from the About Google page to the list of products and the Web Search support site. 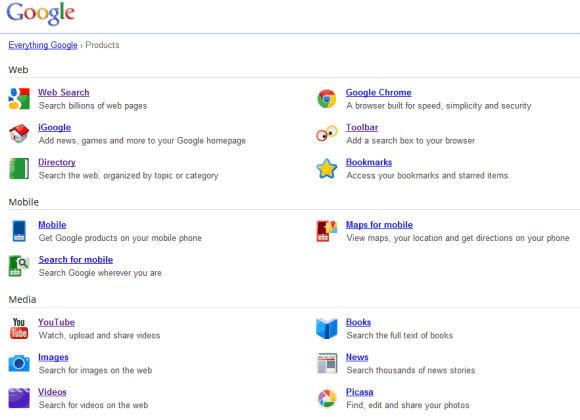 "Back in 2008, Google's first homepage linked to Stanford Search and Linux Search." I think that needs changing to 1998. Someone seems to have hijacked the www.google.com/linux address. It redirects to www.google.com/webhp, which many articles on the web say is related to a trojan of some kind. I didn't say that Linux is no longer popular. Google's Linux Search and all the other custom search engines were outdated, no longer popular and not very useful either. The search engines didn't have any magic features and you can get the same results using Google Search by adding [linux], [bsd], [mac] to your query. Hey - [linux] seems to work! Can I put [australia] to only get pages from Australia? Great photos are you using the 60 mm? Any tips for getting shots like this amazing body of work in photography.